It’s that time of year when I think about chocolate – a lot. I love the holiday season for all the sweet treats that are available and if they’re chocolate, that makes it even better! Which brings me to today’s featured cake. It’s a naked chocolate cake but what stood out most for me was the scalloped icing. I have a confession to make – I love Oreo cookies. Which is probably why I had to choose today’s wedding cake to showcase. It looks like a stack of Oreos. OK, well it looks like a stack of Oreos to me. I’ll also confess that I’m not a huge fan of naked wedding cakes. I’m too much of a frosting fan to purposely eat a cake that lacks frosting. So here we are a few days post-Halloween. Have you had your fill of chocolate and sweets yet? No? Good because today’s wedding cake is ah-mazing! Check out this ooey and gooey chocolate caramel wedding cake. While I’m not normally a fan of “naked” wedding cakes this chocolate creation has delicious caramel, salted peanuts, and chocolate ganache between each layer. There’s no need for icing! 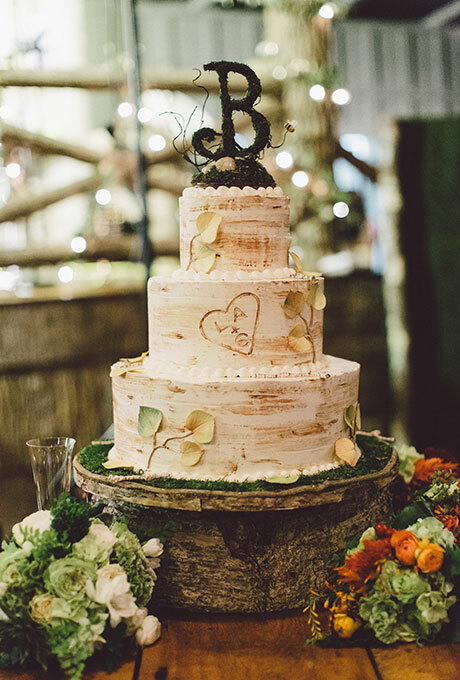 This cake is gorgeous and decadent and it’s perfect for a fall wedding! This cake was created by pastry chef Jason Schreiber. You can find it here. It’s November! There is no denying it now – we are celebrating all things fall! 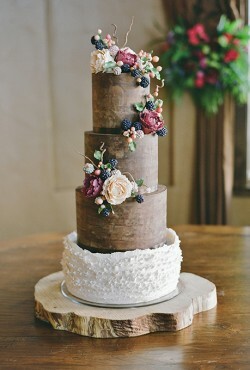 For me, a fall-inspired wedding cake features dark hues with some pops of dark colors. Take today’s cake for example. As we inch closer and closer to Halloween I love finding cakes that fit in the season! Today’s naked chocolate cake is perfect for fall (and even a Halloween-themed reception). I’m normally not a huge fan of “naked” cakes – I love icing too much to serve a cake that is seriously lacking in that department. 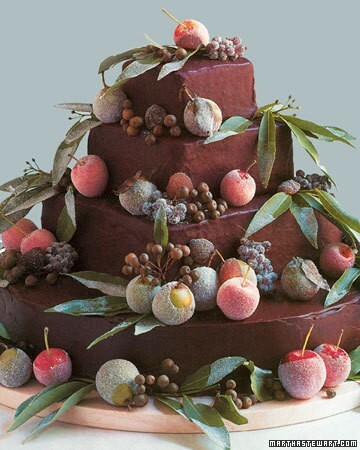 I think chocolate cakes are perfect for fall and winter weddings – they’re dark and decadent and seem to fit in with the colors and themes at this time of the year. The temperatures are turning cooler. Everyone is busting out sweaters. The leaves are falling. It’s pretty much the most wonderful time of year. 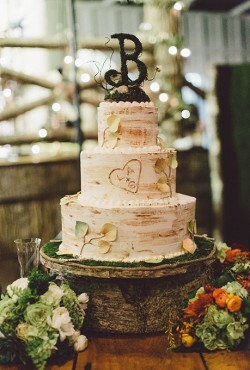 And if you’re planning a fall wedding there are so many amazing ways to incorporate fall into your reception. We’re getting closer to Halloween which means the store shelves are stocked with all kinds of chocolate. And that’s not a bad thing in my opinion! 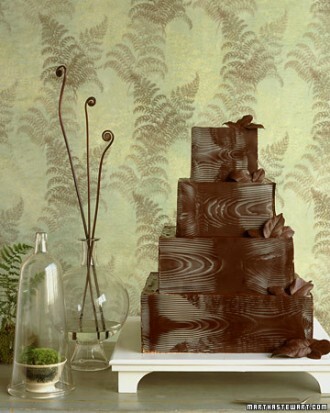 Fall seems like the perfect time to have a chocolate wedding cake – especially one that is frosted with deep, rich chocolate icing. If I’m being totally honest, I have chocolate on the mind this week. 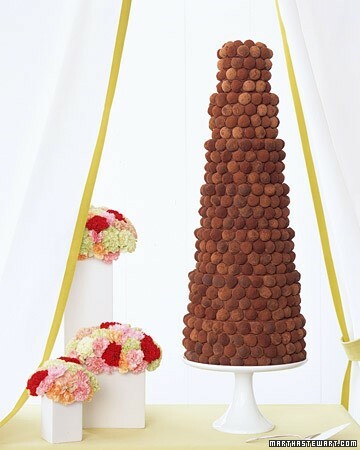 The other day I gave props to the gorgeous chocolate crepe wedding cake and today I’m talking about this amazing chocolate truffle tower cake. Look at this cake. It is almost too amazing to eat. The cake is inspired by the corquembouche, a traditional French wedding cake. Each of the truffles is rolled in assorted cocoa powders which give the cake layers of color and flavor. And if the truffles aren’t enough to grab you, underneath the chocolate goodness is a yellow butter cake that is filled and frosted with more chocolate – chocolate ganache to be exact. 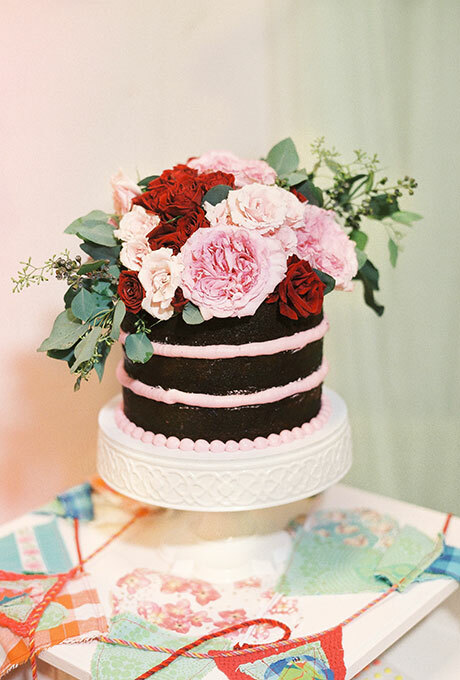 This is basically the most perfect chocolate wedding cake ever. And if you’re feeling particularly ambitious, you could actually make this cake. You know, as a DIY project. Check out the details here. You’ll find this truffle cake here. And when we’re talking about wedding cakes I love unique chocolate cakes. Like this crepe wedding cake, for example. Look at how gorgeous this cake is! 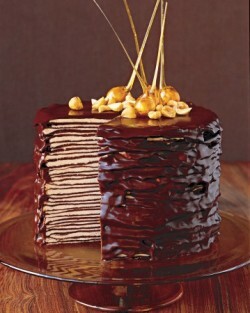 Layers of thin crepes sandwiched between dark chocolate glaze and hazelnut filling. It is pure chocolate bliss.